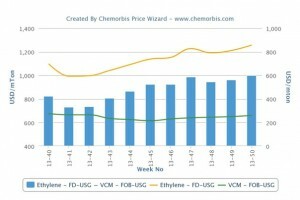 American PVC prices retained their strength in global markets including China, Turkey and Egypt this week as per the pricing service of ChemOrbis. 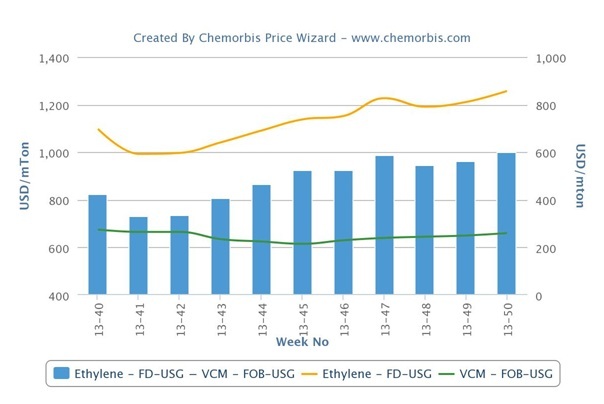 Strong ethylene and VCM feedstock costs in the US drove PVC prices higher in those markets as the previous lower ends becoming increasingly scarce in the spite of the fact that overall demand is subdued as the year and is approaching. Meanwhile, US producers have already started to seek fresh increases for January and even February in their domestic market given increased demand and upward pressure from costs. Five US PVC producers are reportedly trying to obtain increases for the next two months. Sellers are pushing for increases ranging between 3-5 cents/lb ($66-110/ton) for January while a few producers divided their increases by asking for 3 cents/lb ($66/ton) in January and an additional 2 cents/lb ($44/ton) in February. Hike announcements came after the higher November ethylene contracts in the US, which settled at 46.25 cents/lb ($1019/ton) FD USG, up 1.25 cents/lb ($28/ton) from October. Players had been expecting an increase based on rising spot ethylene costs in the country. Spot ethylene prices have been steadily rising on an FD USG basis since the first half of October. Offers gained 2 cents/lb ($44/ton) since December started while the total increase amount with respect to a month ago is more noteworthy at 4.75 cents/lb ($105/ton). Soaring spot prices may drive the next ethylene contract higher. In Turkey, American PVC k67 prices posted a $10/ton gain on the week while offers below $1000/ton are becoming increasingly scarce. “Our counter bid at $1000/ton for US PVC k67 was rejected by our supplier,” a distributor reported. On the other hand, a trader reported that they conceded to $10/ton discounts on their prices for US PVC, citing weak demand. “However, the latest news from the US, suggest that there might be even further hikes as there will be limited cargoes from the country in January due to planned maintenance shutdowns. As the lack of strong demand may put a cap on hike attempts and we anticipate a more or less steady trend over the near term,” a trader highlighted. A pipe producer who received an offer at the high end of the overall US range said that they found the price to be unacceptable given the low season for their end products. According to ChemOrbis Price Index, import US PVC prices edged up $5-10/ton in Egypt this week, with buyers saying that sellers elected to lift their prices given firmer export offers out of the US. Offers for this origin are likely to remain strong as American producers continue to see good demand both from their own local market and from export markets in South America. Plus, some producers will reportedly have maintenance shutdowns in January, which suggest limited availability from that country. Buyers, in the meantime, believe that higher levels may not be obtainable ahead of the approaching holiday season.